Nicolas Volet et al. have reported on “Micro-Resonator Soliton Generated Directly with a Diode Laser” in Laser & Photonics Review. 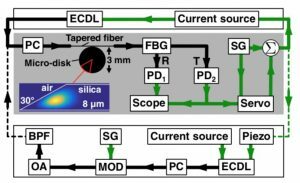 An external-cavity diode laser for 1550-nm wavelength is reported with ultra-low noise, high power coupled to a fiber, and fast tunability. These characteristics enable the generation of an optical frequency comb in a silica micro-resonator with a single-soliton state. Neither an optical amplifier nor a modulator is used in the experiment. This demonstration greatly simplifies the soliton generation setup and represents a significant step forward to a fully integrated soliton comb system. For the full text article, click here.